Picky eating among children is a common but burdensome problem that can result in poor nutrition for kids, family conflict, and frustrated parents. Although many families see picky eating as a phase, a new study from Duke Medicine finds moderate and severe picky eating often coincides with serious childhood issues such as depression and anxiety that may need intervention. According to the study, published August 3 in the journal Pediatrics, more than 20 percent of children ages 2 to 6 are selective eaters. Of them, nearly 18 percent were classified as moderately picky. The remaining children, about 3 percent, were classified as severely selective — so restrictive in their food intake that it limited their ability to eat with others. 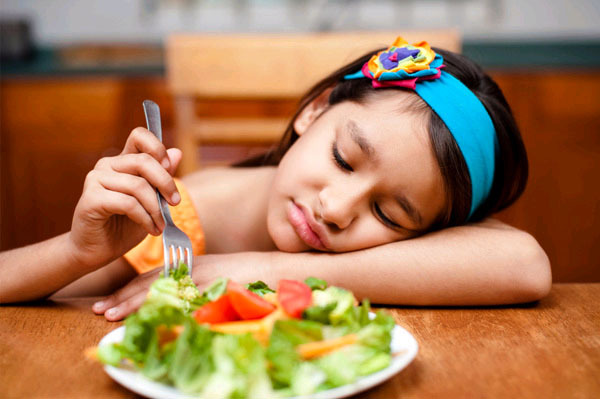 Children with both moderate and severe selective eating habits showed symptoms of anxiety and other mental conditions. The study also found that children with selective eating behaviors were nearly twice as likely to have increased symptoms of generalized anxiety at follow-up intervals during the study, which screened an initial 3,433 children. The study found that both moderate and severe selective eating were associated with significantly elevated symptoms of depression, social anxiety and generalized anxiety. The findings also suggest that parents are in conflict with their children regularly over food — which does not necessarily result in the child eating — and families and their doctors need new tools to address the problem, Zucker said. Zucker said some children who refuse to eat might have heightened senses, which can make the smell, texture and tastes of certain foods overwhelming, causing aversion and disgust. Some children may have had a bad experience with a certain food, and develop anxiety when trying another new food or being forced to try the offensive food again, she said. “What’s hard for physicians is that they don’t really have data to help predict which children will age out of the problem and which children won’t, and so they’re trying to do the best they can with limited information and interventions,” Zucker said. Some children may benefit from therapy, which may include demystifying foods that cause anxiety through exposure. But traditional methods may not address children with sensory sensitivities, for whom some smells and flavors are too intense and may never be palatable. New interventions are needed to deal with children who have sensory sensitivity and frequent experiences of palpable disgust, Zucker said. Treatments also need to be better tailored to a patient’s age range. One benefit to spotting picky eating in young children is that it’s a condition parents can easily recognize, and it could be a good tool for identifying who may be at risk for anxiety and depression. “It’s a good way to get high-risk children into interventions, especially if the parents are asking for help,” Zucker said. In addition to Zucker, study authors include William Copeland; Lauren Franz; Kimberly Carpenter; Lori Keeling; Adrian Angold; and Helen Egger. The study was sponsored by the National Institute of Mental Health (RC1-MH-088678, R01-MH-075766, R01-MH-081025). The above post is reprinted from materials provided by Duke University Medical Center.